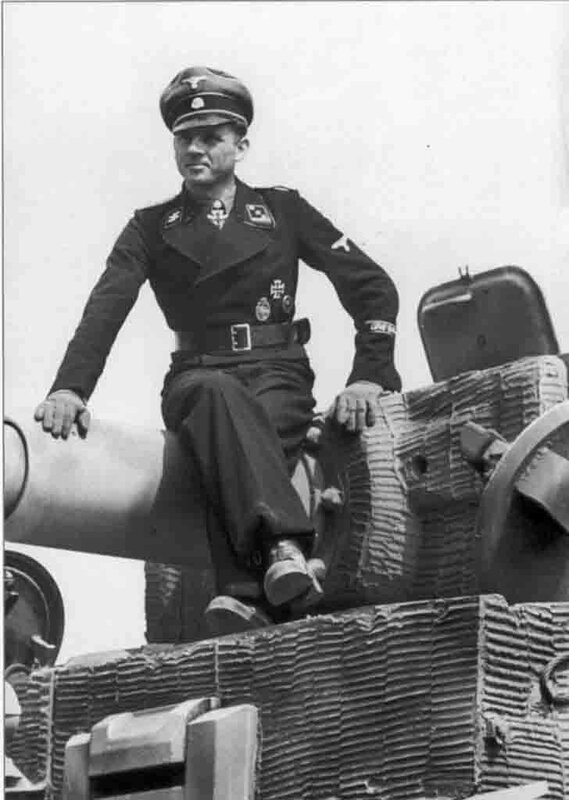 SS-Hauptsturmführer Michael Wittmann – the legendary Nazi tank ace (1914-1944) sits on the armor of the “Tiger” heavy tank. SS-Hauptsturmführer Michael Wittmann became famous in the battles of Kursk, when the July 5, 1943 on the first day of the Battle destroyed eight Soviet tanks and artillery guns 7; all in the Battle of Kursk in his account there were 30 tanks and 28 guns. But worldwide fame for SS-Hauptsturmführer Michael Wittmann brought the fight in the French town of Villers-Bocage in June 13, 1944, he was for a few minutes in its “Tiger” heavy tank number 007 at the head of the other five tanks crushed the exploration of the 7th Armoured Division British . In this battle, the German tankers destroyed 25 British tanks and 28 other armored units. By June 14, 1944 SS-Hauptsturmführer Michael Wittmann Nazi tank ace destroyed 138 tanks and 132 guns. SS-Hauptsturmführer Michael Wittmann died August 8, 1944 in a battle near the town of St. Aignan de Cramesnil. The most common version – the side of “Tiger” heavy tank of SS-Hauptsturmführer Michael Wittmann hit by a shell from a powerful gun from the American Sherman Firefly medium tank, because of which the ammunition exploded, instantly killing the tank of SS-Hauptsturmführer Michael Wittmann and his crew. In 1987, the French road services, which dealt with the extension of the road, came across an unmarked grave. It remains of the SS-Hauptsturmführer Michael Wittmann Nazi tank ace were found, which was the greatest of all time a tanker. Now the SS-Hauptsturmführer Michael Wittmann was buried in the soldier’s cemetery in La Cambio.